(Release Date: September 23, 2014)  An untamed, uncompromising post-apocalyptic vision of Australia in the "Mad Max" vein, "The Rover" is a scabrous, tightly drawn chase dramaeven if, ultimately, the narrative doesn't lead anywhere particularly new. Writer-director David Michôd (2010's "Animal Kingdom") and cinematographer Natasha Braier certainly have a handle on their spare, evocatively dusty mise en scène. The plot, set ten years "after the collapse," doesn't bother to go into any more detail than this about the country's disintegration. In a near-desolate wasteland where provisions are scarce and little roadside dives have become brothels for young, usually underage boys being pawned off for cash, former farmer Eric (Guy Pearce) sets out to make a group of thieves pay who have just stolen his car. While in hot pursuit, he meets the injured Rey (Robert Pattinson), left for dead by brother Henry (Scoot McNairy)the current driver of Eric's car. As Rey recuperates, his need for answers over why his own flesh and blood would abandon him collides with Eric's drive to reclaim his valuable property by any means necessary. In "The Rover," Guy Pearce (2014's "Hateship Loveship") and Robert Pattinson (2012's "Cosmopolis") are such compelling leads that one wishes more was deemed from their characters' past lives to contrast the virtual hopelessness of their current surroundings. Where their journey takes them has been seen before, but Michôd is such an adept craftsman at stripped-down action set-pieces and quietly stirring showdowns that it works all the same. And, even if the third act doesn't quite add up to what the viewer hopes or expects, the final scene does provide a logical, smartly revealed little payoff. Special kudos for one of the most unexpected, unorthodox soundtrack cuts of the year. In the midst of a tone favoring the bleak, the savage, and the tough-as-nails, who could have anticipated the use of Keri Hilson's "Pretty Girl Rock" as one of the few poignant lifelines to a modern, buzzing world that, for Eric and Rey, no longer exists? From the very beginning, it is obvious that "The Rover" is going to look stupendous on high-definition Blu-ray. Crisp and vivid, each shotfrom the close-ups of Guy Pearce's face, with each line and pore wholly discernible, to the gravel across the desert roads, to bravura establishing shots that find arresting vibrancy and contrast in its predominate color palette of yellows and brownsappears free of flaws. When sparks of brighter colors show up, as in the deep blues of dawn in a late scene, it proves all the more impressionable. The 5.1 DTS-HD Master Audio is a marvelous sonic presentation. The music score and sound cues come alive, as do whizzing bullets that startle as they seemingly burst out of the speakers and into the viewer's home theater. Dialogue is consistent and evenly mixed, as well. 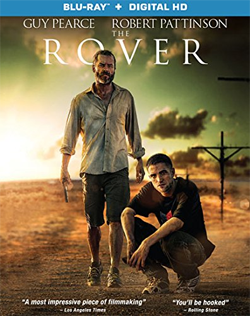 Released by Lionsgate Films and A24, the Blu-ray release of "The Rover" delivers top-notch on the A/V front and, if a director's commentary might have been nice, there is still a very good documentary to accompany the feature. Though its familiar dystopian concept is left underexplored, the film itself is worth seeing for its clear-cut artfulness and the fine performances from Guy Pearce and Robert Pattinson. Recommended.